It's quite common to watch a film slowly play the wrong cards, and begin to lose grip on its hand and steadily come tumbling down by the time the credits roll. Plenty of films begin coming undone by the midpoint and have lost all hope by the end. Rarer, though, is feeling pleasantly immersed in a film, only to then find yourself immediately thrust from your willing suspension of disbelief and back into the cold, real world where you simply can't believe that your enjoyment level in a film has changed so much and so rapidly. Nerve is, ultimately, one of those films. I found myself enjoying the first two acts despite their many flaws. I was engaged by the film, I enjoyed its visual style and its energy and its performances. It was by no means perfect, and I kept feeling frustrated by the film's inability to grasp its true potential, but I was perfectly entertained. And then, in the blink of an eye, the film hits the conclusion of its second act and begins to focus on its endgame, and the whole thing comes hurtling down like a house of cards in a hurricane. Nerve itself is a fictional app that allows users to pick one of two options: Player, or Watcher. The Watchers give the Players dares across a 24 hour period, and with each dare completed the Players move up the daily rankings until two are left, who then compete to win all the money they have earned across the day. So when Vee (Emma Roberts) suffers an embarrassing rejection and the accusation that she is too sheltered and withdrawn, she becomes a player in the game, paired up with Ian (Dave Franco). They find themselves popular within the game, slowly drawing a fan base, but as the dares become more sinister and dangerous, Vee begins to question whether the whole thing is really worth it. It's a terrific concept, and with the right handling Nerve could make for a thrilling experience that also has something real to say about the way technology and social media currently engulf the life of young people. Instead, though, the film takes its interesting premise and mostly squanders it, focusing on all the wrong elements of the game's impact and never really coming to life. Nerve doesn't really get off on the right foot to begin with. Vee immediately feels like a cliched and bland character, and her motives for joining the game are questionable to say the least. The film's editing and cinematography also don't quite work early on, with the editing seemingly rushing to get to the action and the camerawork coming across as forced, perhaps even awkward. It constantly feels like the film makers are focusing on finding cool shots rather than ones that feel organic within the world of the film. Once Vee and Ian are paired up, though, things take a turn for the better. The film finds a sense of fun with an enjoyably silly sequence inside a department store, there's a particularly thrilling moment involving a blindfold and motorcycle which the film never quite manages to top, and Roberts and Franco give enjoyable performances and form some solid on screen chemistry despite the fact that their characters remain as two dimensional as they were when the film began. Nerve injects itself with a sense of life and energy as Vee and Ian fly through dares under the neon glow of night time Manhattan, and I found myself pleasantly surprised by how much I was enjoying watching all of this take place. Even with this enjoyment, though, Nerve seriously struggles with finding its own identity. It completely fails in setting up a collection of fresh and exciting characters, which immediately holds the film back, but then the first hour jumps so wildly from tone to tone and genre to genre that it can be tough to really focus on what the film is actually trying to achieve here anyway. Nerve begins as a typical high school film, with Vee debating whether or not to go to College and crushing over boys, but Nerve itself looms over her like some kind of dark temptation. When she joins the game it begins lightly and Nerve is fun, but once the dares escalate Nerve becomes dark, but it hasn't earned the transition. It can't decide whether it wants to be a commentary on today's youth culture, or a glimpse into the near future looking at where we could go next. It can't work out whether it wants to tell a human story or an inhumane one. It offers flashes of social commentary, but then drops them in favour of a cool action scene tinted with gleaming neon lights. Once things kick off the film is exciting visually, at least, but its tone and thematic constructs jump erratically from scene to scene and it makes Nerve a frustrating experience for its first hour, even if you're on board with what the film is trying to do. But then something happens. Vee does something she shouldn't do, and the film wraps up its second act and heads into its third, and everything that Nerve has worked towards comes crashing down. The film's final act is overblown and, frankly, utterly ridiculous. Even on the most fundamental level, the entire final act operates on a piece of the film's logic that just does not hold together. The film essentially opens by saying that law enforcement aren't aware that the game exists, and it's a laughable statement even then, but the fact that Nerve's entire endgame relies on this notion is mind-bogglingy stupid. The drama is ratcheted up, but there are no stakes. The threat rises, but the ending is predictable. The social commentary is even so foregrounded that the film completely loses sight of the statement it's been trying to make. What was once a lively and enjoyable film becomes static and cold, and all that once worked is no longer a treat. The flashy visual style is mostly abandoned, the enjoyable performances become too serious, the fast pace comes to a halt. Rather than looking at what made Nerve so fun early on and pushing that through to the final act, the film instead cherry picks all that wasn't successful and focuses on that instead. It's a crushingly disappointing end to a film that was once jam packed with potential. Look, Nerve as an idea is intriguing. It invites countless speculations about the future of technology, and conversations about each viewers' own Nerve limits are bound to follow on every trip home from the cinema. But you can get that from the film's trailers. You can get that from reading this film as a short story, you can get that from hearing about the film from a friend, and you can get that from even reading the film's plot on Wikipedia. Nerve's base premise may be great, but as a film it is too misjudged and structurally sloppy to work. We jump from dare scene to soppy dialogue scene to dare scene to teenage argument to dare scene to soppy dialogue scene and the film can't find a way of connecting it all together without stretching its own rules beyond repair. The idea that the money is deposited to the players' bank accounts immediately after each dare rather than at the end of the game is senseless and only exists to bring Vee's mother into the equation for the final act. 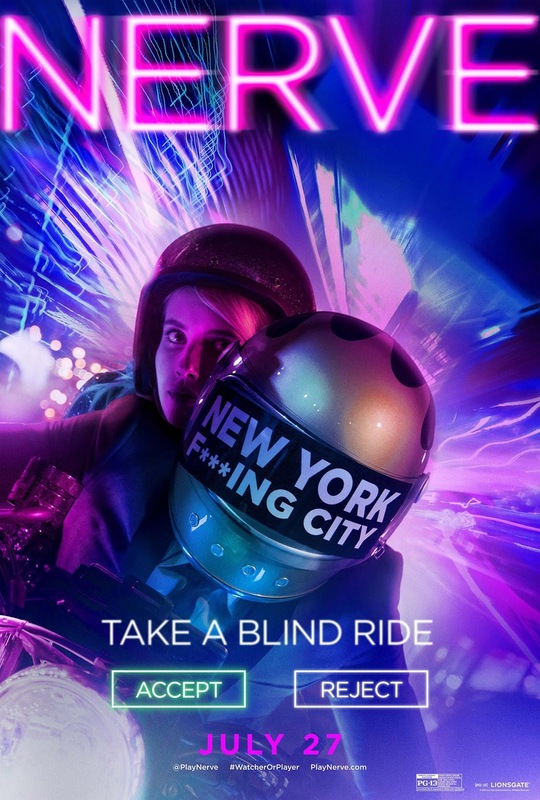 That's the thing with Nerve, it's got such an original concept on its hands that it gets carried away with creating its own lore and logic, and it has no idea what to do with it all. The result is a film that is inherently interesting, but loses sight of its ideas by the time the concept outreaches the story. It's fun while it lasts, but once act three begins it might be time to leave the cinema and pretend it doesn't actually exist. Sure, this leaves the film wide open at the end of act two with no resolution whatsoever, but even that is more satisfying than the direction Nerve goes when faced with bringing all of its ideas together and making one final statement. To Summarise: Despite a strong premise and likeable performances from its leads, Nerve only occasionally manages to out-thrill its choppy pacing, misguided storytelling and woefully problematic final act.